Each year, the Ski Industries of America show enables retailers to see and try all the new gear for the upcoming season. After scouring the show, the following are some nifty innovations that will make your ski life a little easier and more fun. 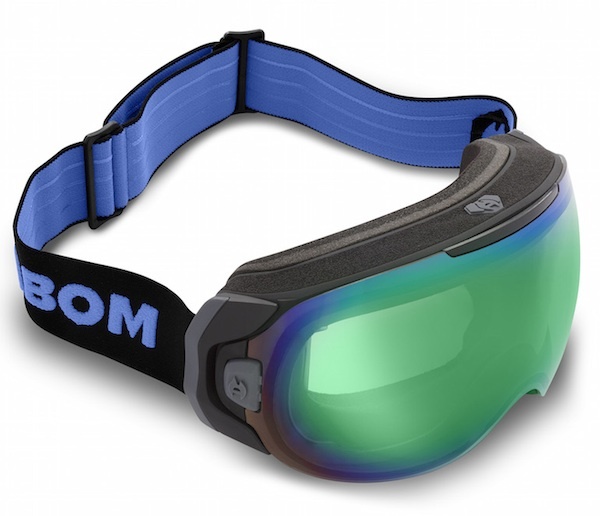 ABOM ski goggles (above) solve the fogging issue with a micro-heater embedded in the lens, and a battery so small it is barely noticeable. Quick burst all the way to six hours of heat to defog. The power button is glove and mitten-friendly. Fits Ski Socks now have a compression ski sock designed by a cardiologist, so the compression works in the correct locations, but not over the whole leg as a tourniquet. Skiing performance is more comfortable, and when you take off your ski boots, they actively work on recovery and blood flow. 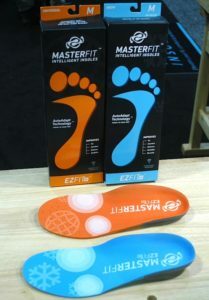 MasterFit re-engineers their quick-fit insoles for both a low volume and high volume foot. Super supportive, yet lightweight, so excellent as a starter in a ski boot, yet a great insole for travel as the weight is minimal. The fact you can move them from shoe to shoe easily is a big plus. They have an arch support that automatically adjusts to your foot. 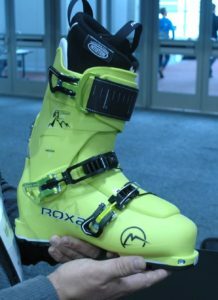 Roxa Ski Boots are a technical brand, and their new R3 is a performance, all mountain boot that embodies the lightness of being while providing superior edge control. Generally, ski boots weigh 11-14 pounds, yet the R3 only weighs 3.35 pounds. Plus, Roxa improved the cabriolet design made famous over the last ten years in high performance and racing boots. Briko makes technical ski helmets worn by many members of the U.S. Ski Team. To improve concussion protection, their new helmets feature a fluid-infused foam set of chambers that slow down the rate of deceleration for the brain when in a fall. Moreover, it provides this extra protection in both straight on and rotational impact falls. Briko helmets have been tested at the Neurotrauma Impact Science Lab in Canada. This fluid system reduces the impact severity by an average of 30% in both types of falls. You snowboard and you ski, but that is too much gear to Sherpa on your next winter vacation. 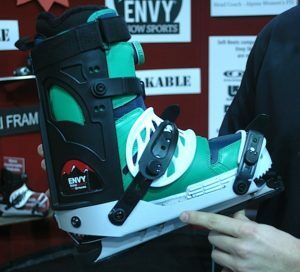 Envy Snow Sports has an innovative frame that makes your snowboard boot an efficient ski boot. The snowboard boot locks in the four buckles on a rigid aluminum binding board. The result is you get your comfy snowboard boots to perform just like a high-end ski boot. For those new to skiing, or want to get their ski legs and technique back the first day, then the Salomon Shortmax 120 is a learning ski with high-performance features. It is perfect for the first day back on the hill, getting balance and turn mechanics down, and then go back to regular skis. Some ski racers use it for this purpose. The fast waxes in skiing are formulated with all sorts of chemical and fluorocarbon compounds. Natural wax hits the slopes with Wend, where their wax is made with meadowfoam flower seed oil. It is fast, durable and totally biodegradable and safe to the touch. Snowshoes are great for going uphill, but really can’t work as a ski in downhill situations, until now. 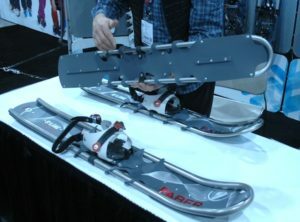 The Faber S-Line is a slightly longer snowshoe with mini tracks/keel on the front and back. The result is you climb the hill; yet can gently slide down the hills, somewhat akin to cross country skiing. Most high-performance goggles are $200, so protecting the lens is more important than ever. However, with the optical curves of the lenses, it has been impossible to put any protection on the outside of the lens. RipClear now makes a protective sheet that goes on the front of the goggles and solves this problem. It is durable and scratch proof and lasts an average ski season. On the ski hill and even other activities, getting the best food blend in a tasty yet quick package has been non-existent. Create38 started with a proven supplement to boost metabolism, then put that product into a series of food bars. They are vegan and paleo-friendly, yet have Michelin-like star rating in food taste. From cherry vanilla to pizza flavor, these bars pack a real food punch without the phone-book dryness of energy bars. 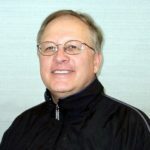 Neil Wolkodoff, PhD, is a Sport Scientist in Denver, Colorado who has worked with golfers and skiers over the last 15 years. A Colorado native, he grew up skiing and still seeks the elusive powder day combined with sparkling winter sun. During balmy temperatures, the rare free times bring travel to exotic golf destinations to see how golf, culture and local geography mix in different locales. He has penned articles for Colorado Avid Golfer, Golf Digest, Golf Magazine and has authored five books. In his travels, he has golfed with royalty, tour professionals, the local duffer, and the occasional goat.